There's been a lot of action lately with the hacked Nook Touch and the fast refresh hack (here, here). There have even been 3 videos posted with the Nook Touch playing videos (animated GIFs, but cool none the less). I was all set to post those clips when I found one of the Nook Touch playing an actual video in a media player. The resolution is only 240p (hardware issues, I'm told), but it does work. 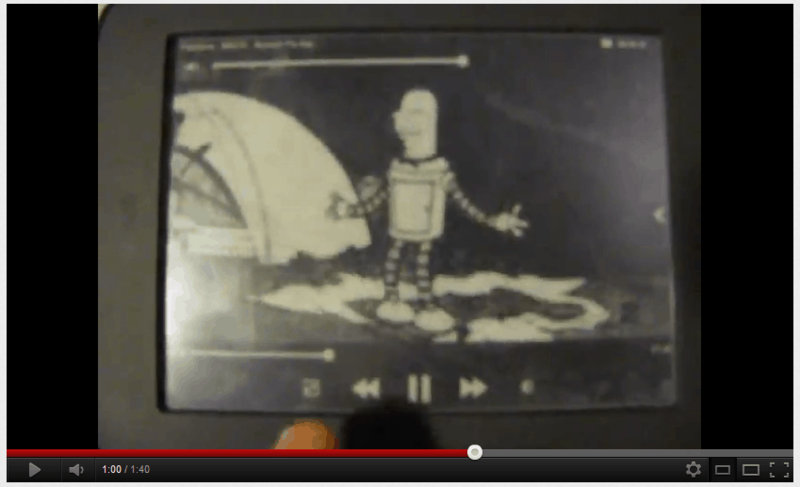 I now this isn't much, but it's still real video on an E-ink screen and it looks like it's nearly 30fps (20 frames per second, at least). We're living in the future. FFS! How in the bloody world did you find those? There’s no “Nook Touch” or even “eink” mentioned in the description and he didn’t even title the damn video clips!! Those 3 clips were all mentioned in the same XDA forum thread. Finding the video clip was dumb luck. GAH! That’s what happens when I skip some days monitoring XDA. That is one of the gifs, I think. The Artist, the first Oscar-winning film made especially for the Nook Simple Touch. Hahahahaha.